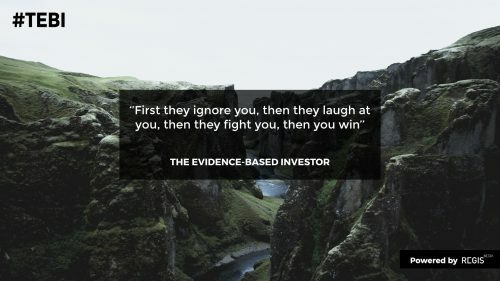 I remember someone tweeting me that quote (often credited, rightly or wrongly, to Mahatma Gandhi) when I released my first documentary about evidence-based investing five years ago. The film’s basic argument went like this. There’s a shedload of academic evidence dating back to the 1950s which spells out how we should invest. It’s not rocket science; in fact, it’s pretty much common sense. In a nutshell, we should take a very long-term view, diversify across different regions and asset classes, and keep costs and trading to a minimum. But all these decades later, there are very few investors who do all of those things, and many who do none. What’s more, people are positively encouraged by most investment professionals, and the financial media, to act in ways that are actually detrimental to our interests. As someone who would regularly read the money sections of the weekend papers, watched financial television and considered himself a pretty sophisticated investor, this came as quite a shock. I expected other intelligent people to share my surprise that all is not as it seems. But no, although well received in the US, where evidence-based investing was already more established, that first documentary had only a limited initial impact in Britain. This month my colleagues and I are launching my fourth investing documentary and the first made specifically for a UK audience, and I’m confident that it will spark much more of a reaction than the first film did. Why? Because, in contrast to five years ago, when I and the likes of Gina and Alan Miller from the True and Fair Campaign were pretty much the only ones raising these issues, public awareness of them is now much greater. For a start, we had the final report by the UK regulator, the Financial Conduct Authority, in June, on its study into competition in asset management. Though it was a rather watered down version of the interim report, as a result of intense lobbying from vested interests, it was still a damning indictment of the fund industry. The picture it painted was of an industry that is deliberately opaque, that is riddled with conflicts of interest, and that makes huge profits for shareholders while adding very little value for end consumers. We’ve also seen the huge outflows from actively managed funds into low-cost index funds in recent years, especially in the United States; the closure of dozens of big hedge funds; and the fall from grace of several “star” money managers on both sides of the Atlantic. The industry can no longer afford to ignore or ridicule those, like the Transparency Task Force, of which I’m proud to be an Ambassador, who are calling for change. It will, though, continue to play for time and to give the impression that it’s changing while in fact it’s trying its hardest to keep things exactly as they are. It will also carry on using its vast marketing budgets to try to persuade people to keep buying just the same sort of products that have served investors so badly. In the meantime, however, people need to invest, and the choice they face is to keep doing what the industry wants them to do, or to act on what the academic evidence says they should be doing to give themselves the best possible chance of achieving their investment goals. Investing: The Evidence was commissioned by the financial planning firm, RockWealth, based in Cheltenham, It sets out, in simple terms, the three main types of investing, namely active, passive and factor investing. It also addresses the issue of risk, the importance of good investor behaviour and, last but not least, the value of working with a first-class financial planning firm like RockWealth. By watching this documentary you will be arming yourself with all the information you really need to know in order to have a successful investment experience. The complete film is 45 minutes long film in one go, but we’ve broken it down into six separate videos for those who’d prefer not to watch it all in one sitting. Slowly but surely, investing is changing for the better. The industry will fight it, but it won’t win. I sincerely hope this film will prove another small step towards the asset management industry we need and deserve. Here’s Part 1 of Investing: The Evidence. Please do share it. We’ll be delivering the other five parts between now and Christmas. At some stage we will be offering a limited number of evidence-based advice firms the chance to buy a tailored version of the film in their own branding. We would also like to produce different versions of it for different markets around the world. Get in touch with us via the Regis Media website if you’re interested. 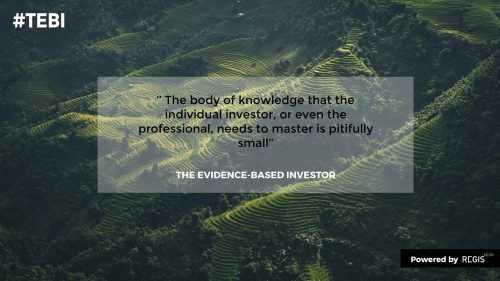 The Evidence-Based Investor is produced by Regis Media, a boutique provider of high-quality content and social media management to financial advice firms around the world. For more information, visit our website and YouTube channel, or email Sam Willet or Christina Waider. We all need to invest. Nobody knows what the future holds, but a typical lifetime includes some pretty major expenses. There’s housing, there are weddings, funerals, operations, holidays, children’s education and cars. And then, of course, there’s retirement. The average life span in the UK has risen to around 81 years, and the number of people living to 100 has more than quadrupled over the last 30 years and continues to grow. People retiring today will typically spend 20 years or more in retirement, which is a very long time to last without a regular salary. So how should we invest? How do we give ourselves the very best chance of achieving our financial goals? At the very least, how do we ensure that we don’t run out of money before we die, and end up relying on the state or on loved ones for financial support? Historically, the biggest investment returns have come from owning shares in companies, or equities. A team from London Business School has carried out a detailed study into the performance of different asset classes around the world since 1990s, and found that, over the long term, shares are the runaway winner. Their findings are summarised in a book called Triumph of the Optimists. One of the book’s authors, Elroy Dimson, says: “If you plot through the history, using the work that I’ve done with my London Business School colleagues Paul Marsh and Mike Staunton, where we’ve looked at the performance of individual stock markets — we’ve now got data from 23 different markets, running from 1900 up to 2015 — some of those markets prospered on the way in a direction that was largely going upward and onwards, although there were some setbacks. So let’s look at the figures for the UK. According to Professor Dimson and his team, between 1900 and 2016, cash has delivered an annualised real return — in other words, adjusted for the effects of inflation — of 1%. Bonds have returned 1.8%. But shares have produced an average annual return of 5.5%. The annualised real return on UK equities between 1967 and 2016 was higher still, at 6.9%. You could, if you wanted, invest all your money yourself, in individual stocks. But the transactions costs incurred would be considerable. It would also be very time-consuming to monitor all the stocks in your portfolio. The vast majority of investors give their money to professional stockpickers who actively manage that money for them. One of the most detailed studies of active fund performance was conducted by a team led by Professor David Blake at the Pensions Institute. Another problem active investors face is that a large number of funds are what are called closet trackers. In other words, although they claim to be actively managed, but broadly track the whole market. After costs, they’re almost guaranteed to underperform. To beat the market, an active manager has to show conviction. But they’re just as likely to be wrong as they are to be right. And just because they’ve been right in the past, that doesn’t mean they’ll be continue to be right in the future. Distinguishing genuine skill from pure luck is extremely difficult. The findings of Professors Blake and Cuthbertson are backed up by SPIVA, the S&P Index Versus Active scorecard. SPIVA confirms that most managers underperform most of the time, and that persistent outperformance is extremely rare. This all begs the question, Why do active fund generally perform so poorly? The central problem is that active management is a zero-sum game; for one manager to win, another has to lose. And because the industry has mushroomed in size, it’s become increasingly difficult for a single manager to outperform his peers consistently. Another question you may be asking is, Why do most investors continue to use actively managed funds in the face of all this evidence that they don’t outperform the market after fees and charges? One reason is that the active fund industry is extremely lucrative, and firms have huge budgets to spend on PR and advertising. Another is that all sorts of financial intermediaries have done very well out of active management and have therefore had little incentive to point out how poor a deal investors have received for many years. Thankfully for those investors, there are alternatives.